Step 2 Sizzlin' Shapes Kitchen Just $24.95! Down From $49.99! You are here: Home / Great Deals / Step 2 Sizzlin’ Shapes Kitchen Just $24.95! Down From $49.99! Step 2 Sizzlin’ Shapes Kitchen Just $24.95! Down From $49.99! Sears has this Step 2 Sizzlin’ Shapes Kitchen on sale for $24.95 (Reg. $49.99)! 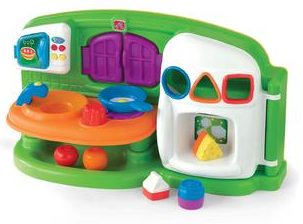 Cook up the fun with the Sizzlin’ Shapes Kitchen! This kitchen features a fun shape-sorting refrigerator doors and a drop-down sink great for learning and sorting. The kitchen counter features an … Order this item today!